Franco-Nevada Corporation's (NYSE:FNV) stock was down roughly 11% year to date through the end of May. That's not great, but it's even worse when you consider that streaming and royalty peer Royal Gold Inc. (NASDAQ:RGLD) is up 9% over the same span. Even silver-heavy Wheaton Precious Metals (NYSE:WPM) has been doing better, down only about 1% (silver hasn't performed as well gold in recent years). Why exactly is Franco-Nevada lagging its peers so badly? The first thing to note when comparing these three stocks is that the year-to-date figures aren't the whole story. If you extend the timeline to three years or five years, Franco-Nevada and Royal Gold are roughly neck and neck, with each up around 40% and 60% in the respective periods. Franco-Nevada even outperformed notably from December 2016 to December 2017, besting Royal Gold by 19 percentage points and more than doubling Wheaton's gain. The recent pullback, then, looks as if Franco-Nevada is simply giving back some of its outsized gains. That has brought its longer-term performance back in line with its closest peers. Wheaton has remained the laggard because struggling silver, about 50% of its production, is still a larger part of its business even as it works to increase its exposure to gold. Wheaton's relative underperformance of its peers over the last few years, as noted above, is largely related to its silver exposure. It's not the best comparison point with Franco-Nevada. However, Royal Gold and Franco-Nevada both get the vast majority of their revenue from gold, making them roughly similar in many respects. 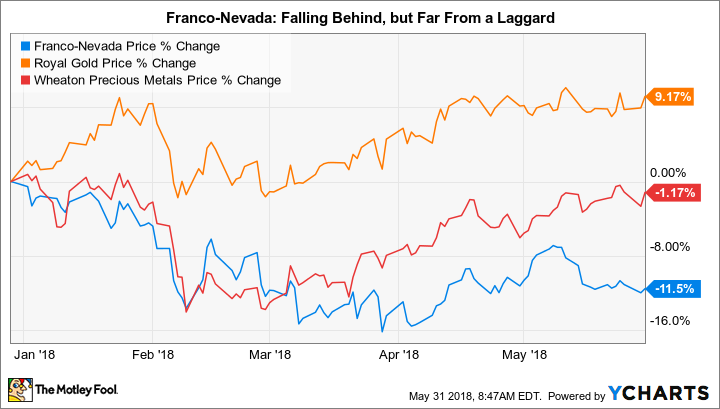 Which starts to show why investors might be worried about Franco-Nevada's near-term performance. Royal Gold's gold equivalent ounce (GEO) production was basically flat year over year in its most recent fiscal quarter. Add in 9% higher gold prices, and it was a pretty good quarter for the streaming company. Franco-Nevada, however, reported a drop of 12% in its GEO production in the first quarter. That isn't out of line with the company's projections, which call for an overall GEO drop in 2018. But any drop is still an unsettling result. On the positive side, though, this dip couldn't have come at a better time, since relatively high gold prices are helping to soften the blow to Franco-Nevada's revenue. In fact, Franco-Nevada was able to push revenues higher by 0.2%. That's tiny, of course, but in addition to relatively strong gold prices, the company's exposure to oil and natural-gas drilling through its portfolio of 82 energy projects (57 producing, 25 in development) also provided a top-line boost. Royal Gold and Wheaton don't have a similar level of diversification. Quarterly revenue from its energy investments increased from $10.9 million a year ago to $19 million in the current quarter, effectively offsetting the weakness on the mining side of the business. Franco used the oil downturn that started in mid-2014 to opportunistically invest in energy, and the benefits of its more-diversified model are starting to show up. Looking ahead, Franco's GEO production in 2018 shouldn't be the only factor you look at. It owns a portfolio of 294 mines (more than any of its peers) in various stages of their life cycles. There is an inherent ebb and flow to the streaming giant's production. Right now it has 50 operating mines and 36 mines in an advanced stage of development, with the rest in the exploration phase. The long-term outlook for the total portfolio at Franco-Nevada is still quite strong, with management projecting a 17% increase in GEO production between 2017 and 2022. Yes, this year's production isn't great, but if you are a long-term investor, you shouldn't be too concerned. Moreover, Franco-Nevada's energy investments are only to get better. Management currently projects a roughly 80% increase in energy revenues between 2017 and 2022. When you add that to the expected increase in GEO production, Franco-Nevada's future starts to look pretty strong. Following the recent price decline, Franco-Nevada's price to tangible book value is roughly the same as Royal Gold's today (Wheaton's silver exposure has led to its trading at a discount to its peers). Although giving back some of the stock's outsized gains between December 2016 and December 2017 makes complete sense, the long-term picture for highly diversified Franco-Nevada has not changed at all through the first five months of 2018. This year will be tough for GEO production, to be sure, but the company's oil investments and relatively strong gold prices look likely to provide ample support to the streaming company's top line. Meanwhile, the production growth opportunities contained in its portfolio, on both the precious metals and energy sides of the business, make Franco-Nevada a worthwhile investment for even conservative investors who can look past a single quarter's or year's production to consider the long-term opportunity.